Two years of training for those who are serious about their growth and what it takes to achieve effortless mastery as a speaker. Ready to commit to real change and uncover your true potential? This journey will be tailored to your personal speaking dream: perfecting that TED talk, creating that magical keynote address, mastering multiple media platforms, becoming an international influencer, inspiring your audience from a global stage. True transformation takes reinforcement and dedicated practice. Each time you re-experience one of our workshops, you will more deeply understand the intricacies of the work and how it can serve you. Emerge from this 24-month program as a stronger, more realized, more masterful speaker than you ever thought possible. You won’t believe the before and after. ​The journey is yours to begin: a $9,000 PLUS value for only $5,750. ​Register during Ignite Your Confidence and receive this amazing two year all access pass for only $2,200! ​or you can pay $380 a month for 6 months. Pay a one-time charge of $2,200. Pay $380 a month for 6 months. Your business not only needs you to be the best, most authentic and confident version of yourself, it needs you to be all that on video! Learn everything you need to know - from planning and conceptualizing your video, to scripting something succinct and powerful, to rehearsing in a way that feels natural, to filming so that you always look like a pro, even if you’re really in your living room! Guest speaker Jennifer Shanse from UpperStory films will answer all your technical questions about setting up a home studio or working with a videographer. She’ll also film and edit your final project on day three. Three days to polish your existing material. Bring a talk, a video course, or an idea you’re working on and receive expert direction and coaching as well as input from the group. Bring questions specific to your needs. ​Learn Danielle’s personal 90 minute Peak Performance Routine and explore advanced storytelling concepts in depth. What mixed signals are your body and voice giving out? Tap into your power and align your mind, body and voice to the same message so you can own that confidence and authority! Build real, lasting relationships with your audience. They've come to you for a reason. Learn to hear what they're not saying so you can address their unspoken concerns and earn their trust, loyalty and raving reviews! Do you know what it is about YOU that makes someone excited? Once you know what sets you apart from the crowd, you can harness that light and let it shine on stage, in the office or across the crowd at busy networking event. An online course to take your talk from page to stage without memorizing a single word. Our rehearsal techniques will keep your talk fresh, flexible, and authentic so that you are speaking from the heart and inspiring your audience to action. 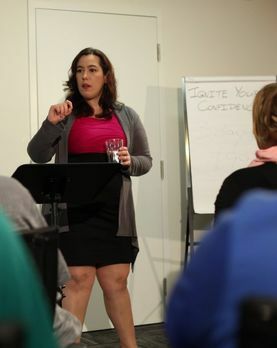 Danielle will guide you through the entire process, from conceptualizing your idea to choosing visual aids, anticipating your technical needs, and rehearsing in a way that allows you to speak from the heart in a structured, organized and eloquent way. Contact Danielle for other financing options, future dates and program information.